Indian Navy Sailor Recruitment 2019 (भारतीय नौसेना के नाविक भर्ती 2019- ऑनलाइन नाविक प्रविष्टि, अधिसूचना लागू करें ): The higher secondary pass candidates who are waiting Sailor for Senior Secondary Recruits (SSR), they can apply online for Indian Navy Sailor Recruitment 2019 before the last date. We are providing information on Indian Navy Sailor Recruitment Notification. The candidates can get all details of Indian Navy Selection Process and a method of apply online for Indian Navy Sailor Recruitment Application Form which is given under the section. The Indian Navy wants to recruit sailor for SSR 2019 batch. So, The candidates can fill up an application form before the last date on this page and Latest Government Jobs Application. Latest Update: Indian Navy is going to publish the Sailor Recruitment 2019 Notification to fill up the various vacancies. Interested & eligible aspirants can fill the application form before the last date. The Indian Navy has released employment news for various post of Sailor. The candidates who have completed a 12th class or its equivalent education with Maths & Physics and at least one of these subjects-Chemistry/ Biology/ Computer Science, they can fill the online Indian Navy Sailor Application form. The candidates also can check their eligibility for Indian Navy Sailor Vacancy on this page. The candidates must possess higher secondary exam or its equivalent education from a recognized board with Maths & Physics and at least one of these subjects-Chemistry/ Biology/ Computer Science. The candidates should have been born between 1st Feb 1997 to 31st Jan 2001. The candidates will be selected on performance in the Written Exam, Medical Test & Interview Exam. Firstly the candidates go to the official website of Indian Navy. Search “Indian Navy Sailor SSR Recruitment 2019” link. Now Click on the “Apply Online” button. Attached all qualification document copies with the application form. Now Check all information in the Application Form carefully. The interested and eligible candidates can apply online for Indian Navy Sailor SSR Recruitment before the last day. The candidates want to collect more information about Indian Navy Recruitment Notification which is available on the official website. 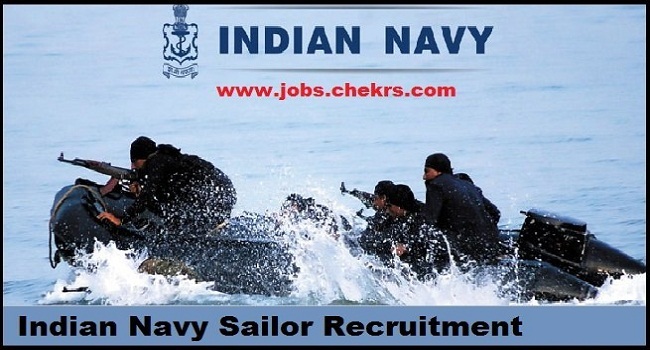 To receive the latest Indian Navy Recruitment, keep visiting our website that is www.jobs.chekrs.com. If you have any query about Indian Navy Jobs that you can write comments on the commenting box and take a review or feedback.